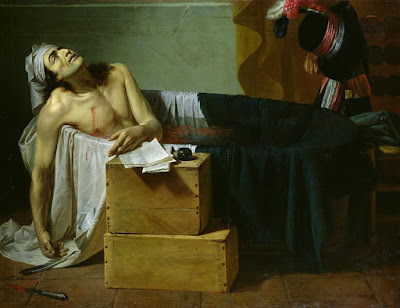 Roques, Mort de Marat (1793) 163.2 cm x 128 cm. This striking rendition of the death of Marat by Guillaume-Joseph Roques (1754-1847) is the only painting of the subject to approach David's in sophistication and technical competence. Roques was a prominent provincial artist from Toulouse. 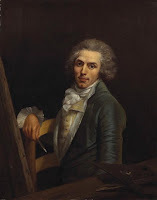 In 1778 he had won the first prize of the Royal Academy of Painting and made the trip to study in Rome. He returned to Toulouse after a few years and became an influential teacher; Ingres was among his pupils at the Toulouse Royal Academy of Arts. Roques seems to have weathered the vicissitudes of the Revolution and Restoration without trouble; his best known works apart from the Marat are a set of canvasses depicting the life of the Virgin Mary, painted from 1810–1820 for the choir of the church of Notre-Dame de la Daurade. Roques's Marat is stated to have been commissioned by the municipality of Toulouse for an official ceremony of commemoration. Roques must have come to Paris and viewed David's painting, but elected to alter the composition to add greater realism. Marat is caught on the point of death; the bloodied knife lies on the floor and his quill has already tumbled from his hand. The ugly features, black hair and shadowed jaw are those of the real man; the torso and muscular arm, whilst still idealised, suggest the strength of the Revolutionary. Roques also gives us a convincing interior, with a tiled floor, rough plaster walls and a large bath where Marat's blood floats on the green water. The austerity is relieved only by Marat's hat, with its extravagant ribbons, the symbol of the martyr's dedication to the Revolutionary struggle.